Baby Girl Reeves, a black female, died Thursday, Feb. 23, after being shot in Vermont Knolls, according to Los Angeles County coroner's records. Lexington Elliot Brandon, an 8-month-old black baby, died Tuesday, Nov. 1, in the 3200 block of Flower Street in Lynwood, according to Los Angeles County Sheriff’s Department investigators. Lexington's maternal grandmother called 911 about 4:53 p.m. after she walked into the kitchen where her daughter was giving the baby a bath, Lt. Mike Rosson said. Paramedics took the unresponsive baby to a nearby hospital where he was pronounced dead at 5:45 p.m., according to Los Angeles County coroner’s records. 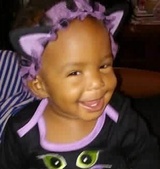 Maliaya Tademy, a 2-year-old black girl, was fatally stabbed Monday, May 2, in the 3500 block of Arlington Avenue in Jefferson Park, according to Los Angeles County coroner’s records. Shortly before 10 p.m., officers from the Los Angeles Police Department responded to a call of a battery at a home and found Ebony Epps, 22, and her daughter, Maliaya, inside with multiple stab wounds, police said. Both were taken to a hospital, where the child was pronounced dead. Epps, who is pregnant, remains hospitalized. The unborn child is expected to survive. The suspect in the stabbing, Lataz Gray, a 22-year-old black man, had been dating Epps for about six months. Gray moved into the home about a month ago, and is not Maliaya's father, police told The Times. After the stabbing, Gray was treated at a hospital for a cut for his hand. Kellyane Tonyebell, a one-month-old black girl, died Friday, March 4, of a drug overdose in the 13000 block of Los Angeles Street in Baldwin Park, according to the Los Angeles County coroner’s office. At about 5:30 a.m., the girl's mother saw that the baby was not breathing, according to L.A. County Sheriff's Lt. Joe Mendoza. The mother then attempted CPR and called 911. Paramedics took the girl to a hospital where she was pronounced dead at 6:28 a.m., according to coroner’s records. The cause of death was not clear at the time, Mendoza said. In late June, deputies received the toxicology report from the coroner; it said Kellyane died of an antihistamine overdose. Detectives are trying speak to the mother, but Mendoza said she is out of the country. Autumn Johnson, a 1-year-old girl, was shot and killed Tuesday, Feb. 9, in the 300 block of North Holly Avenue in Compton, according to authorities. Shortly before 7 p.m., the child’s mother, Blanche Wandick, was preparing her child a bottle when she heard gunshots. The child was standing in her crib when she was shot in the head. Behind her, blood dotted the driveway leading to the yellow garage where Wandick lives with Autumn's father. Sheriff’s officials said that a gunman got out of a blue Chevrolet Impala, walked toward the home and fired at the garage. The gunman then got back into the car, which was seen heading south on North Holly Avenue. Savannah Coleman, a black female, died Friday, July 24, after being strangled in Chesterfield Square, according to Los Angeles County coroner's records. Elijah McKain, a 2-year-old black male, died Friday, June 12, after sustaining blunt force trauma in Broadway-Manchester, according to Los Angeles County coroner's records. Joshua Eli-King Rieux, a 2-month-old boy, was killed June 4 in the 11100 block of South Normandie Avenue in Westmont, according to Los Angeles County Sheriff’s Department detectives. Rieux’s mother, Jacquline Rieux, 25, was also found dead at the scene. June 11, 12:48 p.m.: An earlier version of this entry said Jacquline Rieux was 26. She was 25. Investigators have not released the cause of death or other details about the victims. Jacquline Rieux’s husband, Algernon Fitzgerald Rieux, a 26-year-old black man, was arrested on suspicion of two counts of murder June 5. The June 4 incident began at 8:12 a.m., when South Los Angeles Station deputies received a call about a baby not breathing, according to a Sheriff’s Department news release. Baby Boy Griffin, a black male, died Friday, April 24. Josiah Ray Williams, a 1-year-old black baby, died April 16, 2015, after he sustained blunt force trauma 9000 block of Sepulveda Boulevard in Westchester, according to Los Angeles County coroner’s records. About noon on April 12, paramedics responded to call about an unconscious child at an urgent care center and reported that Josiah had shallow breathing and bruising on his body. Paramedics took Josiah to the hospital where doctors determined that Josiah's injuries were non-accidental. Days later, Josiah was pronounced dead, according to coroner’s records. That evening, police and doctors questioned Josiah's parents. His mother said that two weeks earlier, Josiah had fallen on his head at a park and hit a metal crate. According to the mother, the baby was taken to the hospital and released.